Filtered water offers a lot of benefits over standard tap water. While water quality varies from place to place, it’s almost always worthwhile to use some sort of filter. There are lots of different types of water filters, but one common option is to use a countertop unit. Today, we’ll help you find the best countertop water filter for your needs. How does one choose from the hundreds of competing products? Well luckily, we’ve done the heavy lifting for you. This guide will go over the best countertop water filter systems that we’ve found – as well as explain why you may want to use one. Let’s get started! 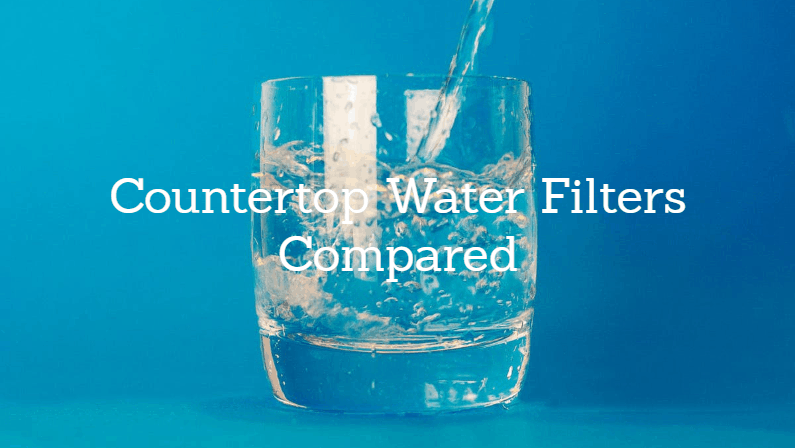 We used a combination of our own findings from hands-on tests, data from manufacturers, and feedback in countertop water filter reviews to make these selections. The Home Master TMJRF2 is the best countertop water filter according to our tests. It features a 3-stage filter that’s effective in removing up to 93% of chlorine, fluoride and other chemicals, plus lots of other contaminants that may be in your water. The efficient, space-saving design fits in just about any kitchen, and fits most sinks. The small size and easy installation of the unit makes it very portable and easy to use. This unit is made by a trusted company, and has earned excellent rankings in countertop water filter reviews from real customers. It’s our #1 recommendation overall! Click here to learn more. 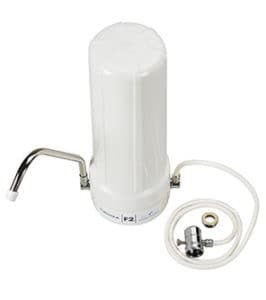 The CleanWater4Less is perhaps the best countertop water filter for those on a tight budget. The upfront cost of the unit is quite reasonable, and unlike most comparable products this one doesn’t need replacement filters. It’s designed to last for around 10,000 gallons, and is effective in filtering out many common contaminants. The unit is fairly small, and simply styled to fit in with most kitchens. Both the upfront cost and ongoing cost to maintain are quite low – but keep in mind that since the filter is not replaceable, you’ll eventually have to replace the entire unit. With that said, the filter lasts a LONG time, so the average cost per year is still quite low. Click here to learn more. 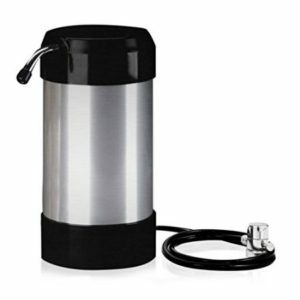 The Big Berkey is a unique water filtration system that needs to be manually filled from the top. So, unlike the rest of the products on this list, this unit doesn’t actually attach to your sink. This has a number of benefits – namely, it can be placed anywhere that you want, instead of having to be placed next to your sink. 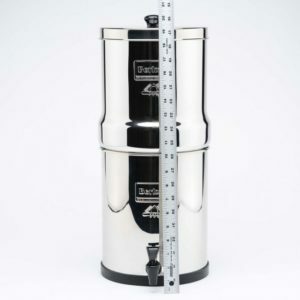 Berkey is a very trusted name in the filter industry – check out our Berkey Water Filter Reviews page to learn more. This unit has two different filters: one to filter out common contaminants, and another to filter out fluoride. Most comparable products on this list don’t filter fluoride, so this is a big plus. The filters are designed to last a long time, and can be individually replaced as needed. Click here to learn more. 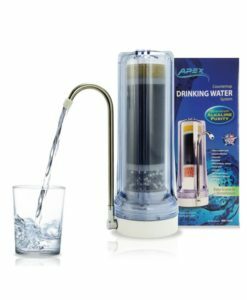 The APEX MR-1050 alkaline countertop filter is a unique product that is actually see-through, so you can see your water being filtered! The clear housing lets you see inside the unit and observe the 5-stage filtration process. The unit also adds healthy minerals (like calcium, potassium and sodium) back into the water. It features long-life filters that are effective in removing most contaminants. The entire unit is made in the USA, which is rare these days! Click here to learn more. Improved Taste – Filtered water simply tastes better than standard tap water. Unfiltered water can take on a variety of undesirable flavors – chemical/chlorine tastes, earthy/dirty tastes, bitter tastes, and more. By purifying and removing contaminants from the water, filters can help to significantly improve taste, odor and appearance of your drinking water. Safety and Health – Unfiltered tap water can contain a host of unpleasant and potentially harmful contaminants. The most common is chlorine, which is added to most water supplies to kill bacteria (and is also linked to cancer and many other health concerns). Other potential contaminants include heavy metals like lead and aluminum, bacterias, sediment from organic particles, and more. Filters can effectively remove many of these contaminants, which can potentially improve your health and reduce your risk for various medical concerns. Peace of Mind – Peace of mind is a priceless commodity, and knowing that you’re drinking the cleanest water possible is a very good source of this rare feeling. Cost Savings – Counter-top water filters are affordable, and the upfront cost is offset by savings from less purchases of bottled water and other drinks. If you’re buying drinks regularly because you don’t like the taste of your tap water at home, a home filter can save you a ton of money! Filtration Technology – We looked at the type of filter(s) used in each model, as well as how they were designed and implemented. Not all filtration techniques are created equal, so we picked products with advanced technology to get our readers the best products possible. Value – We looked for affordable models that would be accessible to a wide range of people, and that offered significant value for your hard-earned money. We also considered ongoing expenses, such as the cost of replacement filters and the expected lifespan of the equipment. Size & Appearance – Since countertop filters go on – you guessed it – your countertop, you want something that looks nice and is not too large. We did our best to pick filters that looked sleek and low profile. Reviews – We looked at a lot of countertop water filter reviews from customers to help round out our own findings. This allowed us to determine how real customers all around the world (with different tap water quality) felt about each product. Didn’t find what you were looking for? Check out our guide to the best water filters in every category for some more options.